A typical piece by Galien-Laloue depicts Parisian sidewalks or avenues crowded with people or turn-of-the-century tourists mingling before the capital’s monuments. Here we have a scene of the well-known Place de la République, a large plaza in the Parisian district La République, which is named after the French Republic. The bronze monument at the centre evolved out of a competition, which was held in 1879. The idea was to design a great monument devoted to the Republic. The Morice brothers won the competition; Léopold Morice designed the statuary and the plaques of historic scenes. Charles Morice, his architect brother, designed the base. The monument was erected in 1883, when an inauguration ceremony took place on July 14th. 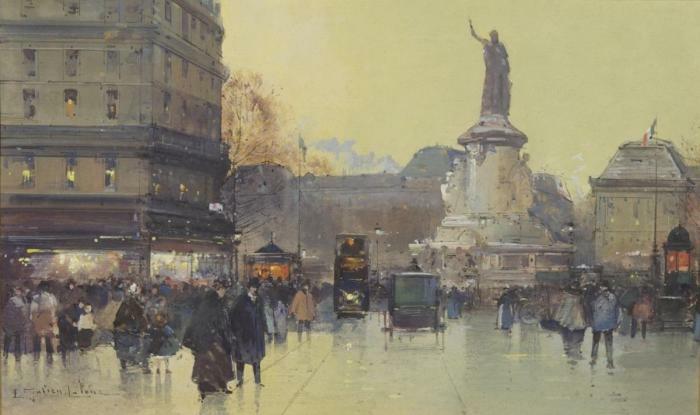 With an eye for detail and colour Galien-Laloue was able to record the Parisian life with its horse-drawn carriages, trams, flower stalls and newsstands. In this watercolour he exquisitely creates a feeling of twilight falling at the Parisian city centre. He vividly renders the shimmering lights of the street lanterns and shop display windows by applying subtle highlights of paint on the paper. Galien-Laloue is rightfully recognized as one of the top masters of French impressionist street scenes. 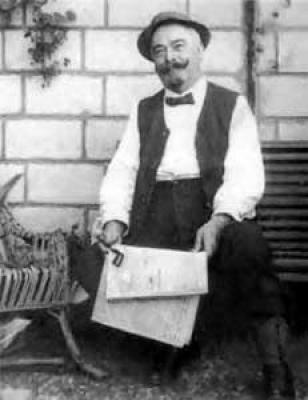 Eugène Galien-Laloue, acknowledged as one of the top painters of Paris of his time, lived most of his life in Montmartre. In 1874 he was employed by the French Railway lines when the company expanded its network from Paris to the French provinces and needed an illustrator to travel and paint the new section of the rail network. At that point he started painting regularly. In 1876, at th . . .